Of all the celestial phenomena, the solar eclipse produces the strongest impression. From time to time, the Sun, Moon and Earth are aligned. And if the Moon is between the Earth and the Sun, it will block the daylight and in those places on the earth's surface, over which the moon's shadow will run, there will be a solar eclipse. 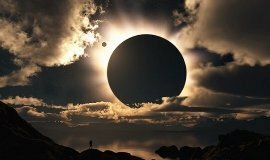 A solar eclipse can occur only in the new moon, when the moon is facing the Earth with a dark, uninitiated side. A solar eclipse is accompanied by a number of interesting phenomena in the surrounding nature. Animals behave unusually, anxiety is observed in the behavior of domestic animals, and some wild animals, instead of hiding from the approaching person, are directed to him, as if in search of protection. The sun is crucial for the life of our planet, and therefore a detailed study of its structure is a very important task. Our star by the name of the Sun has been studied now like no other cosmic body or phenomenon, but much remains to be learned about it in the future.